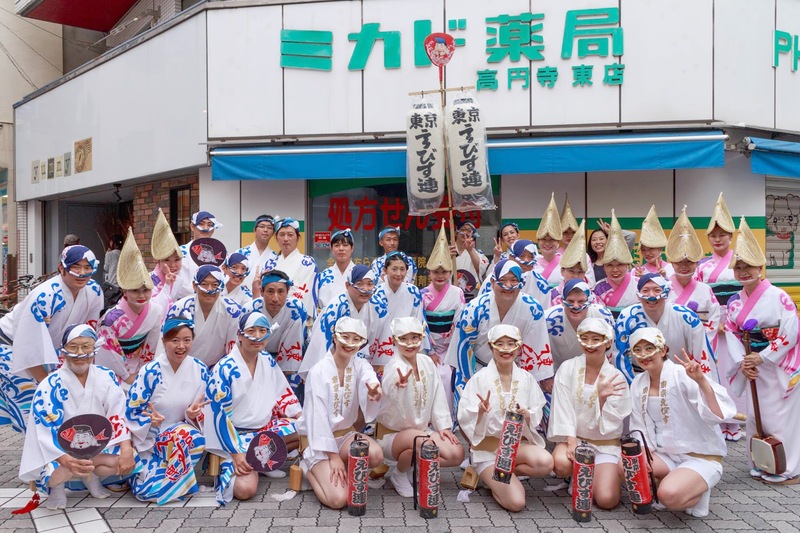 Koenji Awa Odori, as you most likely already know, is the largest festival of its kind in Tokyo, and this year was its 59th birthday. Each year, the number of teams and performers have been steadily increasing, making it by far the most diverse in style. Of course, it's also increasingly crowded, which can make it quite frustrating for spectators who face difficulties finding somewhere from which to view it, and even more difficulty in getting to such a spot. As performers, we're mostly shielded from the crowds, but it does also mean being paddocked in to a large extent. This time, we had a number of special guests from Tokushima Ebisuren who flew in especially to perform with us. Among them were 5 otoko odori, 2 onna odori, and 2 shamisen players—it was nice to hear the shamisen again, as all of our own are temporarily assigned to drums, quit, or missing in action. Of course, this meant we had to prepare and bring along 9 extra costumes, but that was a very small price for the value they brought. Four of my temporary teammates were people I'd trained and performed with in Tokushima quite recently, and the other I was already friends with from years back, so this made it much easier to get everybody organised. Everyone on both sides was cooperative and helpful, and I think the sense of solidarity came across in the performances. One of the things I like in particular about Koenji is that several of the stages are modelled after the Tokushima stages—wide enough to move, and "jumpers" heavily discouraged. I saw the festival staff dealing with people who were encroaching on the performance space quite harshly on a number of occasions, which is most likely in the name of safety—all participants this year had to sign up for a mandatory insurance, but I don't know if this was a result of something happening during a previous year or not. But I digress, the widest stages tend to have the most enthusiastic crowds, so we like to show them something special if we can. Because of the sheer numbers of teams though, any team that stops to perform a routine causes a caterpillar effect holding up all the teams behind, so it's been heavily discouraged in recent years. As it turned out, some space had opened up behind us at all the larger stages so we were able to stop and give a short set piece without causing a fuss. Similarly, as we approached the final goal point, I checked behind us and there was a space of maybe 30-40 meters open, so I gave the signal to perform an "abare" routine, a very high paced wild dance with jumping and shouting which is a huge crowd pleaser. Typically we start from a triangular wedge formation, and when the music speeds up we all run in different directions, leaping into action. Always nice to give the audience what they want! Update: It seems a Mr Philbert Ono captured the precise scenario I just described on video. We managed to complete 5 stages in total during the three event hours, but the final whistle was blown as we were preparing to begin a 6th. I was happy with the 5 we performed though, and the presense of our guests really motivated us and raised the bar of our individual performances. We finished by taking our guests out for a celebratory dinner, which ended the day on a high note. Early departure for me though as I had to get my costume cleaned and dried for the next day.